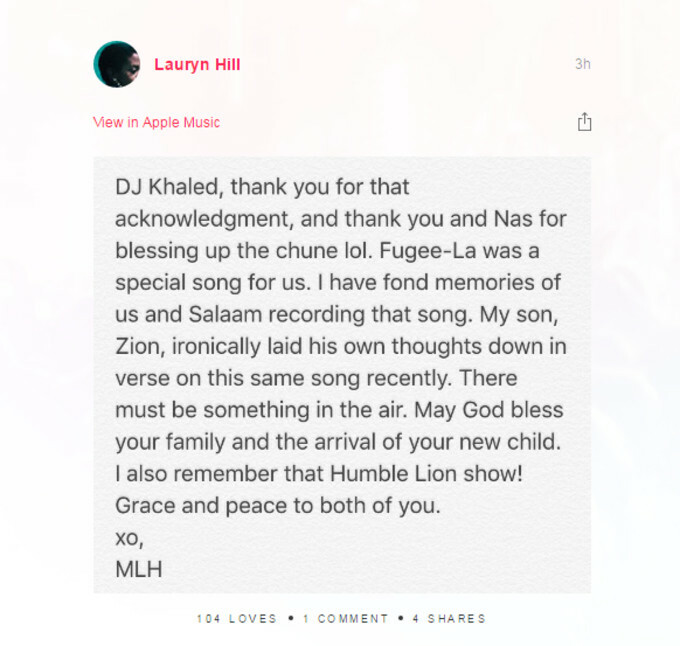 Lauryn Hill Thanks DJ Khaled for Acknowledging The Fugees on "Nas Album Done"
The song, which appropriately featured the NYC rapper, set social media on fire for two reasons: First, it suggested Nas’ next album was completed (and hopefully dropping soon); and second, it was musically on point—thanks in large part to the Fugees’ “Fu-Gee-La” sample, which, according to Nas, was all DJ Khaled’s idea. DJ Khaled also wrote a special letter to The Fugees that he shared on Instagram, breaking down the backstory of how he cleared the sample and why The Fugees was such a huge inspiration to him. Apparently, Hill was more than just “good”; in fact, she seemed completely honored. On Saturday, the Fugees member sent out a heartfelt note to Khaled on her Apple Connect page, thanking him for his acknowledgement. She said “Fu-Gee-La,” which was featured on The Score, was a special song for her and the rest of the group’s members. She also thanked Khaled and Nas for “blessing up the chune” more than two decades after it was released. You can read her note below.